The Cobbler didn’t make it into theaters this year for a reason. Not that it’s horrible, in fact I’ve seen plenty worse movies so far in 2015. That doesn’t mean it’s worthwhile either, and I’m guessing everyone involved knew how little the film did right, how little it has to offer. The film is as oddly fascinating as its central story device. Walk in another man’s shoes. Forge your own path and create your own destiny. Herein lies the mistake; the fascination, for the cobbler and the story, has no focus. It’s so well-traveled that the sweet and sentimental soul at its center busts through its own soles too early and too often. The Cobbler is like the old pair of shoes you tossed in the back of the closet. You know they’re there, worn out, lingering, fetid. That’s the pair you never grab, because like this movie, its irreparable. 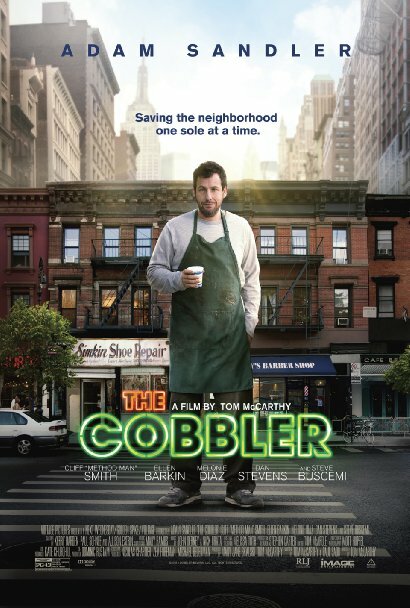 Max Simkin (Adam Sandler) is the cobbler, a gruff and lonely man who lives with his fading mother. He works round the clock in the heart of New York City at the shop his father left behind when he split from his family. It’s a bewildering character setup. Max disdains his father yet carries on the family trade. He’s unhappy with his life yet unwilling to change. Max, strictly by definition, is insane. What comes next is his introduction to the story device that I mentioned earlier. A hand-me-down sewing machine with magical powers is found deep in the basement. Anytime Max fixes a pair of shoes with it, he can slip them on and, Voila!, he’s the person who walked in them. Granted, the scenario is predicated on having the same size 10 & 1/2 floppers, but it’s intriguing nonetheless. From there it’s an absurdist adventure, sourly sweethearted, and heinously heist driven. Max is a doofus, and the result is a film to match…a perfect pair. Up until Max’s discovery, The Cobbler ain’t so bad, although it’s also unremarkable. With his newfound power comes stupid side stories though. There’s one woman whose name escapes me, trying to save historic buildings or something like that. Rapper Method Man plays a gangbanging prick looking to fix up his gator skin boots, and his method acting is a poor man’s angry Ice Cube. Ellen Barkin is a high roller trying to scam the historic buildings. And then there’s Jimmy (Steve Buscemi), an old family friend who offers Max a pickle – from his pickle shop – in all of his scenes. The movie is the definition of madcap. Sandler is here and there and everywhere, shapeshifting from customer to customer while also losing his sense of character. The menagerie of personalities, sometimes perpetuating disturbing stereotypes, play out like a round of one-act vaudeville routines. It’s like a modern-day dime museum. Had it been smart enough to take the highbrow road, I think The Cobbler could have been a successful freakshow. Directed and co-written by Thomas McCarthy, this is the infrequent director’s first bad movie. It has solid editing in the body switching scenes, and he gets everything he can out of Sandler. This is the Adam Sandler I like to see, almost a mashup of his isolated character in Reign Over Me and the crackpot introvert from Punch-Drunk Love. I wish he’d realize where his talent lies. How long can you get older and not wiser, more aged and less mature? I think Rodney Dangerfield is the only actor to pull that feat off. Back to this movie though; The Cobbler actually has a nice little twist to its end that I didn’t see coming. The point A and C are fairly creative. But everything in between is poorly scripted and never thought out. The Cobbler has a great idea, but like a pair of high-end shoes, its ruined after stomping through mud, scuffed and spoiled. I am a huge fan of the filmmaker but all the horrible press this movie received has made me too afraid to watch it. I completely adored his other films and hope this failure doesn’t stop him from developing more exciting projects. It’s a shame that his wasn’t better. When Adam Sandler “goes serious” (ala the fantastic “Punch Drunk Love” and even the very underrated “Funny People”, he really shines. Keep up the great reviews!